NEW ORLEANS, Louisiana, June 1, 2010 (ENS) – Three environmental groups today said that they will use the citizen enforcement provision of the federal Clean Water Act to sue BP in federal court in New Orleans to force a more effective response to the ongoing oil disaster in the Gulf of Mexico. The Gulf Restoration Network, the Louisiana Environmental Action Network, and Environment America last Friday sent a formal notice letter alleging that BP is violating the Clean Water Act by discharging millions of gallons of oil into the gulf from the Deepwater Horizon drill site, by failing to accurately measure its plume and flow, and by failing to remove the oil from the waters on and within the Gulf of Mexico. First, the groups want the damaged Deepwater Horizon wellhead to be plugged, but the “top kill” operation that was BP’s most recent attempt to plug the well was declared a failure on Saturday. 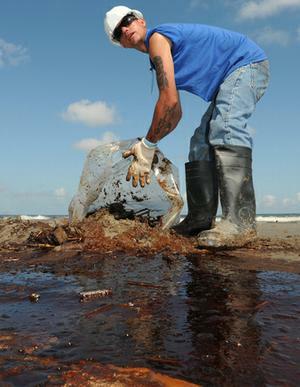 BP will attempt an oil containment operation over the next few days. Meanwhile, oil is still spewing from the broke wellhead at a rate between 12,000 and 25,000 barrels per day, according to estimates given today by U.S. Coast Guard Admiral Thad Allen, who is serving as national incident commander. “The BP fiasco is a tragic reminder that deepwater oil drilling is an inherently dirty and dangerous business,” said Heather Emmert, gulf states field organizer for Environment America, a federation of 28 state-based, citizen-funded environmental groups. “Because BP executives failed to adequately prepare for or respond to this ongoing disaster, citizens are now stepping up to the plate to force a more transparent and effective response,” said Emmert. The federal Clean Water Act allows private citizens affected by violations to bring an enforcement suit in federal court after filing a 60 day notice of intent to sue with the violator and with state and federal environmental agencies. Citizens can seek a court order mandating compliance with the law and with all permit requirements, and mitigation of the harm caused by violations of the Act.